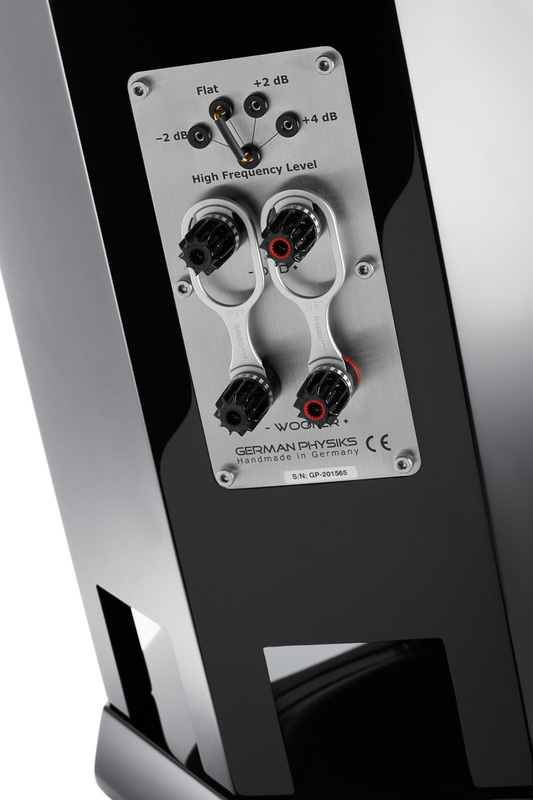 We are big fans of the German Physiks Unlimited Mk II, and not exactly dismissive of the whole omnidirectional loudspeaker concept as a whole, so the chance of looking at the more uncompromising HRS-130 floorstander from the German Physiks range was met with a fairly enthusiastic ‘yes’ from the team. The German Physiks line is comprehensive, stretching from the comparatively humble Troubadour and Unlimited models, right up to the wardrobe-sized, cost no object Gaudi Mk II, but all share a common driver unique to the brand. Brainchild of mathematician and engineer Peter Dicks, the Dicks Dipole Driver (DDD) is something uniquely and genuinely different in a world of ‘me too’ cone and dome loudspeaker driver designs. The DDD here features a carbon-fibre cone, tightly rolled into what looks like a downward-firing megaphone horn. The DDD’s voice coil, spider, and basket are built into the ‘hat’ at the top of the HRS-130’s cabinet, and the cone fires into the body of the loudspeaker. Except that it doesn’t: the large outer surface area of the cone radiates a virtually full-range signal (without crossover, the drive unit stretches down to about 70Hz, and up to 24kHz). Except that, once again, it doesn’t: the cone acts like a four-way loudspeaker system in its own right, operating within strict Thiele/Small parameters in lower frequencies, like a pistonic driver across the midrange, a fully bending wave loudspeaker (not dissimilar to distributed mode loudspeakers and balanced mode radiators) by around 1kHz, and a dipole in the high treble and beyond. All from one drive unit, with no crossover. Conventional loudspeakers tend to produce stereo images that can only be best enjoyed from one ‘sweet spot’ in the room. Move away from that position and both the stereo image and tonal balance become progressively degraded. This is because pistonic drivers tend to ‘beam’, or concentrate their radiation pattern. Worse, this concentration is proportionate with frequency; the higher the frequency, the narrower the ‘beam’.